(Newser) – Even more controversial than Ryan Lochte's new hairstyle: the murky story of what happened with him and other US swimmers in Rio. Although Lochte says he was robbed at gunpoint in a taxi over the weekend with Olympic teammates Gunnar Bentz, Jack Conger, and Jimmy Feigen, the story got weird when a Brazilian judge first ordered the confiscation of Lochte's and Feigen's passports (Lochte had already gone back to the US), then Brazilian authorities removed Conger and Bentz from a plane back to the States; Feigen is still reportedly in Brazil and also being grilled by authorities. The reason for these developments may now be coming to light: A Brazilian police source tells ABC News that surveillance video exists showing "one of the swimmers" busting down a bathroom door at a Rio gas station and getting into an altercation with a security guard. 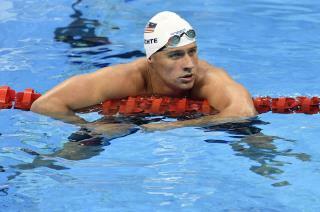 Lochte lives in my friends neighborhood and acts like a fool at the pool. Merely another symptom proving the fact that holding the Olympics in Rio was a poor decision. Many people said so--they warned of the troubles awaiting and no one listened. At every turn the Brazilian government takes no responsibility for anything. From unsafe/inadequate accommodations to dirty pools to polluted water to inadequate mosquito spraying to unprecedentedly rude, jeering locals at the events to ridiculous crime, they deflect and deny that they have a problem. These boys don't look honest but neither does the Rio police. They should not have ever put their hat in the ring for the Olympics and when it was, it never should have been accepted because they're not prepared. There was not so much drama in London. This is a huge blemish on the Olympics of which I'm not sure they can recover.